The Cairo International Book Fair has announced the awards for best books in 11 categories. The awards are given at the end of the fair in the categories for best novel, short story collections, formal and colloquial Arabic poetry, and scientific and children books. Each award is EGP 10,000 ($566). 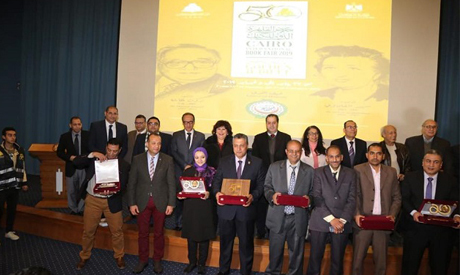 The awards were announced in a ceremony attended by Egypt's Minister of Culture Ines Abdel-Dayem and head of the General Egyptian Book Organisation Haytham Al-Hajj Aly. The award for best novel went to Ahmed El-Koromlawy for his book Nida' Akhir (Last Call), published by Al-Dar Al-Masriya Al-Lubnaniah. Best short story collection went to Mahmoud Ahmed Abou for his collection (Farmalion), published by Dar El-Shorouk. Mahmoud Sebak was awarded in the formal Arabic poetry category for his book Mohawla Le Eslah Al-Aalam (An Attempt to Reform the World), published by the General Egyptian Book Organisation. Best Vernacular poetry collection went to Bahi El-Din Mohamed for his collection Ma' Any Qader Afrah (Even Though I'm still able to be Joyous), published by the General Egyptian Book Organisation. In the arts category, Said Shimi won for his book Khitabat Mohamed Khan Ela Said Shimi (Mohamed Khan's letters to Said Shimi), published by Al-Karma. The children's book award went to Zain Alabidin Fouad, for his book Lana Haq (We have a Right), published by the General Egyptian Book Organisation. The digital sciences category award was withheld. The award for best book in human sciences went to Hamdy Soliman for his book Wahat Al-Rab Al-Aswad (Oasis of the Black God: The Culture of Production in a Desert Society), published by the Egyptian Culture Palaces Association. The scientific book award went to Lotfy El-Sherbiny for his book Al-Wasma Wa Moanat Al-Marad Al-Nafsy (The Stigma and Suffering of Psychological Illness), published by Dar Al-Elm Wal Iman. The literary criticism award went to Reda Attiya for his book Al-Ightrab Fi Shi'r Saady Youssif (The Alienation in the Poetry of Saadi Youssef). In theatre, Mohamed Baghdady won for his book Ya'ish Ahl Balady (Long Live my Countrymen), published by the General Egyptian Book Organisation. Researcher Iman Al-Awady won the first book award for Liberal Thought in Egypt (1919 – 1961). The award for best translated book went to Ola Adel for her translation of the 'Stolen Girls: Survivors of Boko Haram Tell Their Story' by Wolfgang Bauer. The award for best translated book for children went to Ola Adel for her translation of the book Baba Yaga: Russian Popular Tales. The award for best editing of historical texts went to Al-Waleed Mubarak for Al-Kawl Al-Sareeh fi Elm Al-Tashreeh.